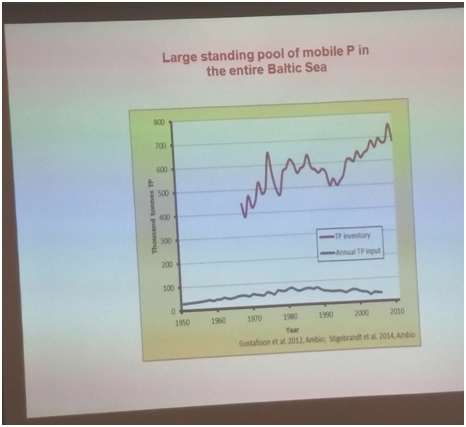 At a Stockholm seminar on the 18th January held by the Baltic Works Commission, scientists, government officials and NGOs came together to discuss the dying briny depths on their doorstep: the Baltic Sea. The general consensus is one of emergency where technology provides an as yet unproven ray of hope. This is only if the countries surrounding the Baltic are ready for bold investments, policy changes and some bold pilot studies. If nothing is done, the nutrients contained in the dead sea floor could flow into the water body and – worst case – cause the whole sea to turn in to a dead algal soup. The sea, surrounded by some 85 million people and comprising of 11 countries – nine with coasts on the Baltic Sea, represents one of the worst-polluted waters in the world. To explain it simply, since the inception of farming and modern sewer systems, nutrients – primarily nitrogen (N) an phosphorus(P) – have been draining into the sea and staying there. Natural systems have been unable to cope with the accumulating nutrients on the sea floor in high concentrations and life has basically died. At present, scientists pronounce one-third of the sea floor dead. People living around the Baltic are familiar with symptoms of this ill-health: ugly green slimy, smelly algal blooms that are toxic to swimmers and disastrous for tourism. The tourist industry representative, Eva Östling of Visita, noted that just the threat of an algal bloom is enough for people to cancel their holiday. 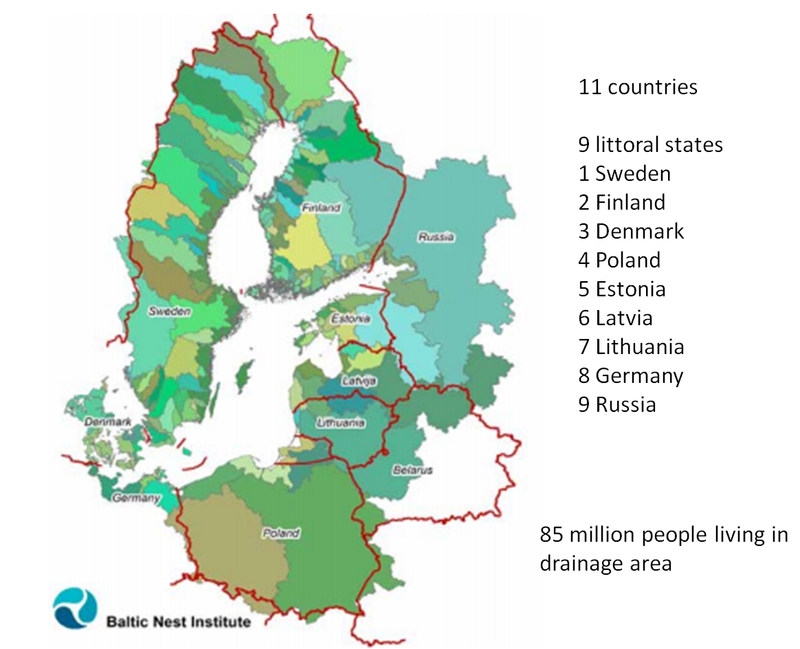 Until recently, the strategy pursued in most Baltic nations has been one of land-based measures that include restrictions on run-off from farms and more measures to improve water treatment plants. However, as many speakers and participants at the seminar pointed out, although emissions in Sweden are back to the level of the 1950s, the threat of permanent collapse is at an all-time high thanks to the internal leakage from the P and N already accumulated. 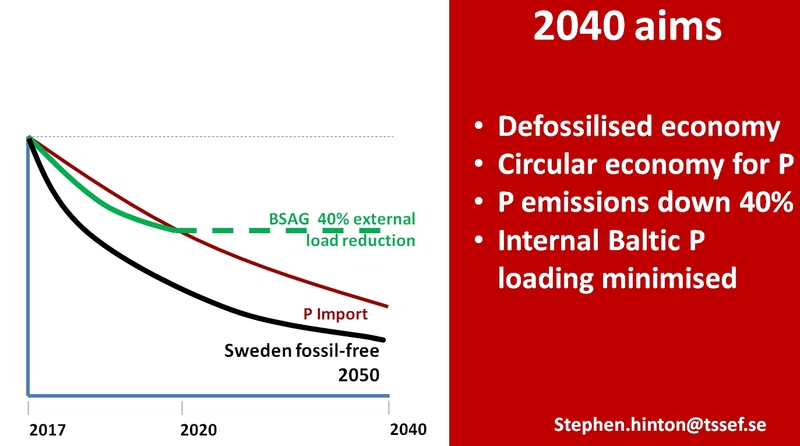 Captured from a presentation by Sven Blomqvist, Stockholm’s University, the red line shows the extent of the internal P loading compared to the external loading represented by the blue line. 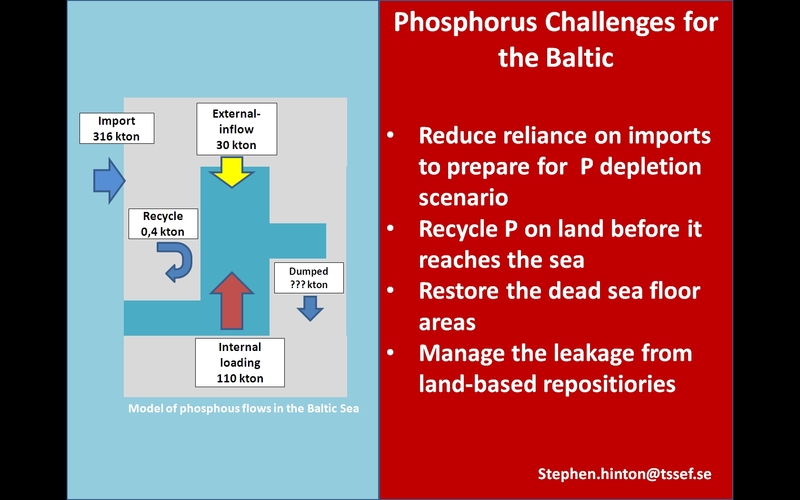 Some researchers put the supply horizon for phosphorus from rock as low as 30 years(1). The diagram below summarizes the 20-year period transformation ahead: defossilization of transport and agriculture, a circular economy for phosphorus including a reduction of external and internal nutrient loading. This assumes that fossil fuel supplies remain available during the transition period. I was asked to present the alternatives the Swedish Sustainable Economy Foundation (TSSEF.se) see as feasible. Our position is that critical substances that should be part of the circular economy should be subjects to sufficiently high import surcharges, and these should increase at regular intervals until the market responds by investing in circular infrastructure. We pointed out that phosphorus from rock is relatively cheap: it costs about 2 Euro per Kilo. Contrast this with the 20Euro is costs to remove it from waste water. 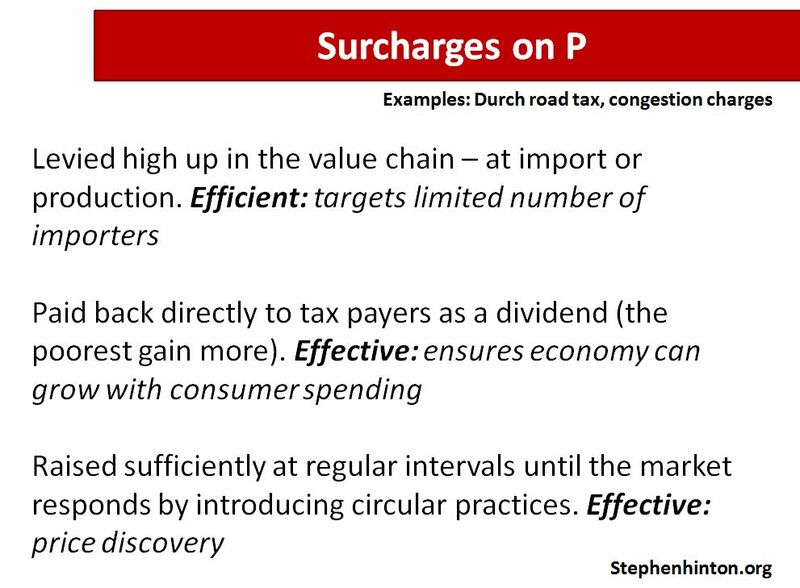 When there is price competitiveness – when recycled P is cheaper than imported – then the market will respond by investing in the circular technology needed. In our view this can best be achieved by putting a surcharge on all phosphorus originating from rock imported into the economy. I pointed out that surcharges once levied remove money from the economy and as such reduce economic growth. They also make food more expensive when applied to P which is essential in agriculture. And these surcharges affect the poor the most. The fairest thing to do is to redistribute the money collected back to taxpayers. 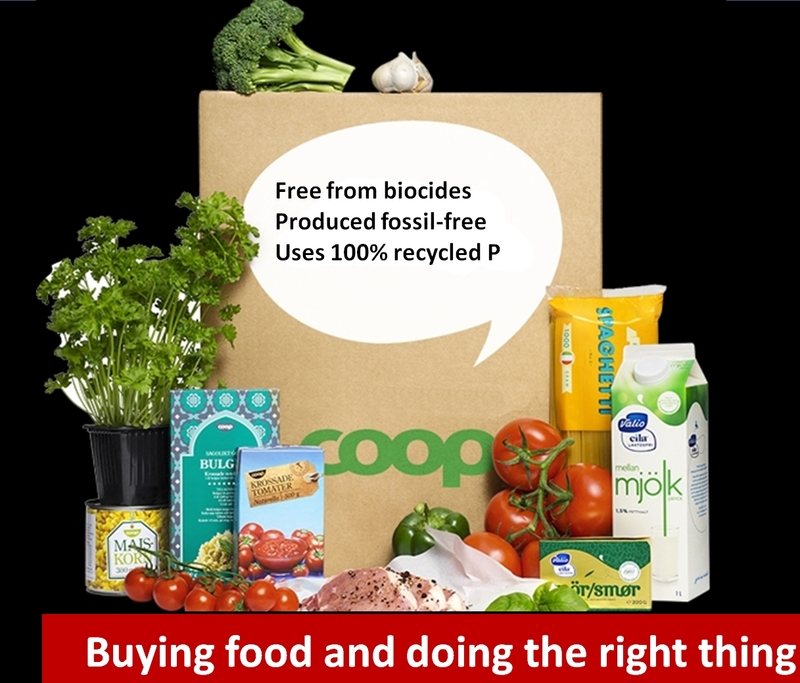 They will get the same money in their pocket and be able to afford food – and when the market responds with circular P solutions – they will be able to buy the cheaper, circular economy food. To illustrate what I mean, I envisage the consumer being offered products and services that are good for the Baltic. In other words it should cost less to do the right thing. Today the market has not offered anything like what is needed. It is just not profitable for it to do so. 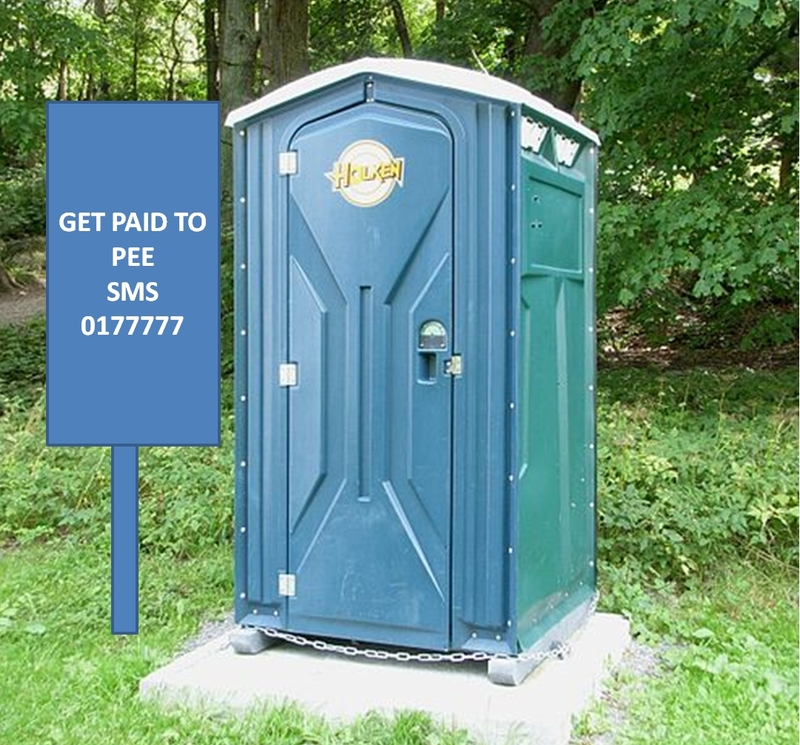 The illustrations below are two main things we in the Foundation would like to see: services that recycle urine – instead of paying to use toilets people should be paid to recycle urine – the main source of P in a circular economy. And we would like our food produced in a way good for nature. The other slide illustrates municipal services. We as citizens would like to see our organic waste collected and recycled. 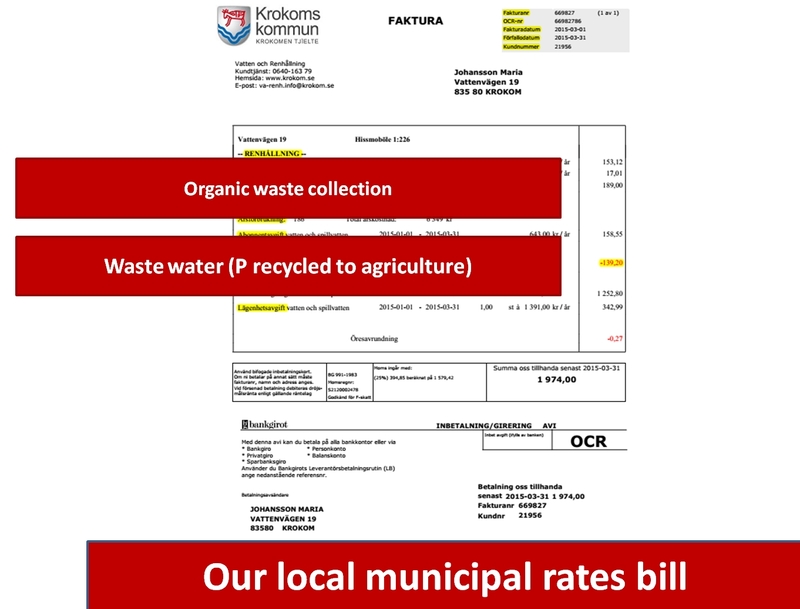 This is what one municipal bill might look like. Deposition of calcium-enhanced clay or similar minerals on the sea floor to bind phosphorus (can be removed and recycled later) (2) . Pumping oxygen down to the dead areas. Removing the organic layer with special dredging technology. My favourite is the idea of sediment removal using non-invasive vacuum technologies. The system invented by Teknikmarknad, an offshoot of KTH Royal Institute of Technology), gently removes the top layer of organic material de-waters it and produces biogas which can be used to create electricity, as fuel and as soil enhancement. This approach provides a pathway to fossil fuel independence and a circular phosphorus economy at the same time. Clabby, C. (2010). Does Peak Phosphorus Loom? Scientists make the case that easily accessible supplies of an essential element are being depleted. American Scientist, 98(4), 291-292. Renman, G., Renman, A., & Gustafsson, J. P. (2013). Reaktiva sorbent för fastläggning av fosfor i Östersjöns bottnar.